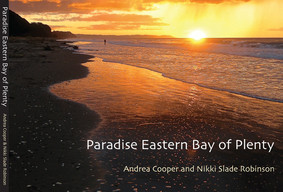 Nikki Slade Robinson an Eastern Bay of Plenty writer. Nikki has illustrated for both the commercial and publishing industries since 1989. Her first book as a writer/illlustrator, "That's not Junk!' was released early 2009, aimed at 4 - 7 years. It went on to be performed at the Floriade Festival in Australia in 2011. Nikki's second book "Hannah Bandanna's Hair" was released mid 2010. 2011 saw "In Love with Moko - the Story of a New Zealand Dolphin" released with co-author Val Bird. Environmental picture book"Munkle Arvur and the Bod", and her first chapter book "Lissy Lamont and the Extreme Scheme Team" (funded by Creative New Zealand) both released in 2012. A selection of other titles Nikki has illustrated include "Mind Your Gramma!" by Yvonne Morrison "The Seven Stars of Matariki" by Toni Rolleston-Cummins (Finalist in the Sir Julius Vogel Awards: Illustration), 'The Pine-cone Track" by Joan Anderson, "Mr Short, Mr Thin, Mr Bald and Mr Dog"/ 'An Explanation of Poetry to my Father" / "How we Fell" all by Glenn Colquhoun, "The Puriri Tree" by Merito Tawhara. Nikki has also illustrated numerous books for the education sector. She lives in the Eastern Bay of Plenty with her husband, children, cats, a patch of native bush and a sense of humour. The book is on sale for around $24:95 from from bookshops and many other retailers around the Eastern Bay of Plenty. It will also be available from Mann Print www.mannprint.co.nz or direct from us. It is A5 size (21cm by 14.8 cm) and is full colour throughout with 100+ pages. It showcases and celebrates this fantastic region. 166 pages in full colour. The Arts people featured come from all backgrounds including aspiring young talent through to wise and mature legends in our Eastern Bay of Plenty community. Arts people are represented from all age brackets including emerging young artists, and those that are thought to be ‘established’ in their arts careers. Whether you are a published author or a secret scribbler, there's a group in Whakatane that is just for you. Anyone interested in the writers' group is welcome. We meet at 2-4pm at Te Koputu- on the first Tuesday of every month at Little Orchard Room Whakatane Library & Exhibition Centre. You are also welcome to email colleenfoley63@gmail.com or phone Colleen on 07 3088509 for more information. “If I was a swearing man”, muttered Harold, “I’d say beggar it!” No one was listening or even cared. Sympathy for him and his friend’s dilemma had been generated through local newspapers but as with most news items, today’s news is tomorrow’s fish and chip paper. It was a year to the day since the residence of Paloway Court Retirement Home had been told of the impending development. The owners and the developer’s patience had, to some degree, been rewarded. Out of sixty-four old folk just six stubborn occupants remained. Harold, his nose pressed against the window, watched as moths, in total bewilderment, danced around the streetlights. “That’s us,” mused the old man, “This is the home for the bewildered,” He began to enjoy the word, thinking that it would be excellent in a game of Scrabble. Margaret heard the rattle of the morning paper being pushed through the slot in her front door, a glance at her bedside clock confirmed it was 6:50am – almost time to get up and start the day. She stretched and luxuriated in the comfort of her large bed, then thought about her plans for the day. – No time to lie abed, lots to do, no time for the usual exercises either! Margaret did take time for one ‘Salute to the sun’ and one ‘Downward Dog’, just enough to loosen her limbs before showering. As she prepared her tea and toast, Margret noticed that a light was glowing in Harold’s living room. “Silly chap”, she thought, “I bet Harold has spent half the night poring over a Thesaurus, compiling lists of obscure words for Scrabble. No thought about our situation and the plight of the “six stayers”. “Cooeeee,” Jennifer called and tapped at the window – what a pair – Margaret, slim, smart and sleek as a whippet, Jennifer, plump, untidy and squashy like a shabby bean bag, opposites it seemed, but the best of friends and great allies in the challenge of rehousing the “six stayers” at Paloway Court Retirement Home. “A cuppa?” Margaret indicated to the teapot in its cosy. “Yes, please,” Jennifer always enjoyed tea at Margaret’s, English Breakfast in a fine china cup, heaven! They sat together, blissfully enjoying the quiet morning, their tea and the comfort of their long friendship. Opposites, they were in more than appearance, Margaret had investments and a disposable income which would make Jennifer’s eyes water and she was very conscious of her friend’s tight budget. So tact and diplomacy would be necessary when outlining any plans for solving the accommodation dilemma. She knew that Jennifer was fiercely independent and proud, so any plan had to be seen to be impartial and fair to all. If Margaret hadn’t been so fond of her friend she could have relocated months ago, but she was determined that the developers treat “the stayers” decently. “Now, what’s the plan, Marg?” Jennifer jolted Margaret out of her reverie and into the present. “We could be roomies,” Jennifer tentatively offered a thought, but she knew deep down that though Margaret loved her dearly, sharing was not an option. Margaret looked rather doubtfully at her friend; Jennifer was clad in a rainbow like patchwork jacket, blue trousers, her trusty Doc Martens and her trademark, capacious Trellise Cooper carrier bag. As Margaret and Jennifer backed out of the short driveway, they noticed Martha’s curtains were still tightly closed. Although Martha kept herself busily occupied with one church group or another, she was always ready for a wave or a friendly chat. Her curtains were open before nine most days and regular activities meant she was often picked up before ten. Something seemed different about today. Margaret was anxious not to be late for their appointment so when Jennifer thought they should at least try knocking on Martha’s door she felt she was being pulled in both directions. This appointment could well hold part of the answer for their shared dilemma. Quite a relief when a familiar Toyota, driven by one of Martha’s friends, pulled in and parked outside. Just as Margaret’s Kia turned right into Dixon Street, Martha’s friend unlocked her door using the key Martha and her family had asked her to hold on to. By this time Harold had finished his quick flick through the paper and muttering about tabloids decided to take a short stroll. The sun was shining and after his exercise he intended checking up on two-letter words that might come in handy when he played scrabble later in the week. ‘Bewildered,’ was taking on a new level of meaning for Harold but he pulled himself together realising that Margaret and Jennifer were already on their way to their appointment. Even found himself wishing he’d accepted their invite to attend that appointment at WINZ. Never did feel all that comfortable coming to grips with the reality of death. However, it was now his responsibility to let Ken and Diane know. At least they had each other for support. Sharing a quick cup of tea before going to enquire about what else they could do, it dawned on Harold, Ken and Diane that now they were five unless for some awful reason Margaret and Jennifer got wiped out on the road. There had been concerns about Margaret’s driving for some time now. The three of them wandered back to Martha’s place where quite a team had gathered including police, victim support and a group of people from Martha’s Church. The police assured everyone that their presence was routine and they would soon be on their way. Martha was totally prepared for this moment. Surrounded by photos of family and friends she sat with a bible on her knee and her almost finished cuppa on a little table beside her. Her morning devotions focussed on a chapter in John’s gospel and Abigail quietly pointed out the verse that began: In my Father’s house are many rooms; if it were not so I would have told you. “Coincidence,” thought Harold, checking the exit in case this religious conversation continued. Then the sound of an overworked clutch reminded Ken and Diane that Margaret and Jennifer were returning from WINZ and they too were about to learn that there were just five stayers at Paloway Court Retirement Home. Harold left Ken and Diane to go and tell Margaret and Jennifer about Martha. “What d’you think is happening at Martha’s? Harold looks upset.” Margaret was worried. “Oh dear! We’d better go in and see what we can do to help. We could make beds and change the sheets for visitors, and do any washing.” Always the practical one, Margaret followed by Jennifer, Harold, Ken and Diane walked into Martha’s just as Abigail hung up the telephone. Jennifer and Martha had been members of a group that discussed and made plans for their own funerals, as a way of making things easier for their families. Abigail opened the folder and phoned the Funeral Director Martha had chosen. “While we are all together, we can tell you what we learned at WINZ today,” Margaret began. “As the motel’s a mortgagee sale it won’t be too expensive. There are three wings each and four delightful apartments and there’s a lovely big common lounge with a kitchen and toilets. We could set up a Trust now with a very reasonable deposit and buy one wing when Paloway Court sells. That would leave eight units to be sold and Hospice, Aged Care and the Alzheimer Society are all keen to join us. Mental Health is backing off, but things look hopeful.” Margaret asked the others for their opinions. “Sounds great,” said Harold with relief in his voice. Thursday was a listless day for all concerned. Martha’s family had yet to arrive. No one felt energised, or that it was appropriate to formalise the Trust fund until after the funeral. Leaving matters in Margaret’s capable hands, she scheduled the meeting with CJ’s solicitor for ten o’clock on Monday. Early Friday morning, as Ken and Diane returned from their stroll along the beach, a taxi pulled alongside when they reached the entrance gate. A sophisticated, middle-aged blonde woman alighted from the front passenger seat. Her trim figure, in a soft gray pencil skirt and jacket to match, worked well with her pale pink shirt and sparkly green eyes. Both Diane and Ken stared at the pleasant round face and wide mouth, captivated by this picture of elegance. “Is this Paloway Court?” she asked in a soft lilting voice that had a hint of an Australian accent. “Yes it is,” replied Diane smiling nervously. Ken just nodded his head in agreement. “I am Martha Gladstone’s daughter, Petronella Townsend, and these are my daughters and my aunt,” she replied, gesturing to the faces peering out the windows. “We are so sorry about your mother lovey! She was a good friend and neighbour for many years, wasn’t she Ken,” babbled Diane, unsure how to continue, but felt she needed to make up for Ken’s abrupt manner. The poor man struggled with the niceties of conversation with strangers. Petronella smiled her thanks, eyes filled with moisture as she looked at the chubby-faced Diane and the tall thin man with a hawk nose before her. If only she had made an effort to visit last Christmas, perhaps her grief would not be so full of painful guilt. Ken and Diane watched the taxi crawl down the drive. Unaware of her surroundings, Diane began to ramble on after the taxi. Out of the corner of his eye, Ken caught a glimpse of movement and turned sharply. He thought he saw Jennifer gliding quickly towards the Strand and vaguely wondered why she was out this time of the morning. Rather out of character, he mused. Saturday came with a weak sun and sharp southerly breeze. Harold and the others sat together in the chapel. The parishioners from her church attended Martha’s funeral accompanied by the many friends she had made through her charity work. The service for Martha was warm and uplifting. Margaret spoke on behalf of the residents of Paloway Court. Jennifer thought her friend was amazing, but struggled with her conscience about how and when she would tell Margaret about Curtis’s offer. Early evening the group returned to the Court, each checking their mailbox before separating. Inside each box an official looking envelop stood out ominously against the stark metal background. Obviously, hand delivered! They stared at each other, and then wordlessly withdrew the item. The communiqué was from the Owners. Margaret broke the spell. “There is no sense in brooding out here, or facing this alone. I suggest we adjourn to my unit and read the contents there.” As if connected by an imaginary thread the ‘Bewildered’ team trouped over to unit 18. A Chinese buyer bought Paloway Court on Thursday, the document explained. They were given notice to vacate their units by the following Friday. The previous Owners had attached to each communiqué a cheque for each individual for the amount owed to him or her. “Yes!” cried Jen, “this is my lucky day! With this money and my lotto ticket, I’m off to sail away.” The others stared blankly at her. Relieved, that she could clear her guilty conscience, she continued to explain. “Curtis is back in town and he has asked me to be a permanent cook on his charter boat, ‘The Wild Card’. I didn’t know how to break the news to you Margaret. I’ve only known since yesterday!” She looked imploringly at her friend. “It is an opportunity for me to become financially independent, I hope you will understand.” I guess that is what my stars meant?” She stood awkwardly, waiting for Margaret’s reaction. To her credit, Margaret kept her poise. Although full of sadness, she wanted the best for her friend. “Of course you must accept his offer, Jen. You are fit and strong, so go with my blessing.” There was a slight waiver in her voice, but she controlled herself and gave Jennifer a hug. Harold and Ken looked at each other, both hoping that the women folk would not break down and become sentimental. Then there were four-mused Diane to herself. What now I wonder? After the funeral, there was a numbness, a lethargy. This lasted a couple of days. Then Harold became impatient. “We are wasting time. If we don’t get down to business tomorrow, we could lose the Motel opportunity.” He exploded. The four stayers got down to business. They negotiated a good price, got the deal done, gave their notice to finally quit Paloway Court Retirement Home and had two weeks to move. They had successfully pushed for a weeks’ extra time. They all rallied around Jennifer, got her packed up and onto Curtis’ boat, as he had to sail to suit the tides. It was a sad farewell. They had lived together for so many years and bonded over their fight to stay. However, the writing was on the wall. They had faced up to that and were pleased for Jennifer’s happiness. Now down to business for the four stayers. There were new carpets and curtains to choose, some painting to be done, new fixtures and fittings to deal with, all under the terms of sale. There was no time to waste or brood. Families had agreed to rally around for that last weekend, for the physical shifting. Ken and Harold found themselves together in the late afternoon, the day before the big shift. They had drifted out to the old park bench, under the kowhai tree. The sun was filtering through the slim branches making long shadows on the lawn, as they sat and reminisced. Check in next month to see what we've been up to! Anyone interested in a writers' group is welcome. We meet at 2-4pm at Te Koputu- on the first Tuesday of every month at Little Orchard Room Whakatane Library & Exhibition Centre. Internationally renowned children’s author, Margaret Mahy ONZ. Described as a ‘giant of literature’, Margaret Mahy, who was born and raised in Whakatāne, passed away in July at the age of 74. She held the country's highest royal honour - The Order of New Zealand – and her literary achievements include 100 picture books, 40 novels and 20 collections of short stories. Many of which have been translated into over 15 languages.